Karnataka, the "Lofty land" is bounded by Andhra Pradesh in the east, Maharashtra in the north and Tamil Nadu and Kerala in the south. A long coastline hedged by miles and miles of tall, waving, palmgroves frames this pretty land. The majority of the Karnataka state lies on the Deccan Plateau. Bangalore is the state capital. Karnataka boasts a diverse flora and fauna, which make it a nature tourist's paradise. The state's long and colourful history, and the many forts, temples, mosques, and churches make Karnataka a great place to explore. Garden city Bangalore, Jog Falls,the beaches of Karwar and Malpe, Golgumbuz in Bijapur, the stone temples of Belur and Halebid, Mysore Palace, the list is endless. Bangalore, the capital goes by many names -- the Garden City of India, India's Manhattan and Silicon Valley. One of the most industrialized cities of the country, its pleasant climate makes it the seat of much commercial and cultural enterprise. Rich in Sandalwood, Rosewood and Silk, it has a lot to offer than a day or two of sight seeing. Founded by the local Chieftain Kempe Gowda in sixteenth century, Bangalore came into its own after it was converted into the summer capital of Mysore by Tipu Sultan. The Wodeyars also contributed in the city's beautification. Bangalore, is undoubtedly the trump card of Karnataka. Karnataka's history takes us back to pre-historic times. The earliest find of the Stone Age period in India was an hand axe at Lingasugur in Raichur district. Chandra gupta Maurya, the great Indian emperor abdicated his throne to embrace Jainism at Shravanabelagola. In 1956, the Kannada-speaking areas were grouped along with the princely state of Mysore to form what we now call Karnataka in 1973. Karnataka has the imprint of many dynasties. 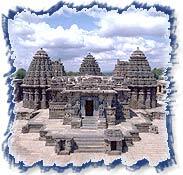 Prominent among them were the Chalukyas, the Hoysalas and the mighty Vijayanagara Empire. 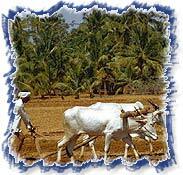 Culture in Karnataka: Karnataka possesses a rich cultural heritage. The folk theatre has an ancient and rich tradition, the two principal forms being Yakshagana and the puppet theatre. 'Yakshagana' is akin to Kathakali of Kerala in the choice of its elaborate costumes and vigorous dancing. 'Bhootada Kunita' (Dance of the Divine Cult), 'Nagamandala' and the demon dance are some quaint rituals prevalent only in Dakshina Kannada coastal area. Sravanabelagola, near Mysore, has a giant 1,000-yr-old stone statue of Bahubali, the Jain saint. Huge monolithic Jain statues are peculiar to the Kannada culture. While agriculture is the major occupation, the state boasts some of the most significant industrial growth in post independence India. Karnataka is as well known for its silk and sandalwood as for its high tech industry. Bangalore, among the fastest growing cities in Asia is home to many industries. The state is rich in mineral ore, and supplies all of India's gold. Other ores mined in the state include iron, chromite, magnesite, mica, copper, etc. The Sharavati, Kali, and the Cauvery rivers have been harnessed for electric power. Karnataka is famous for its aesthetic craftsmanship in sandalwood and rosewood. Eye-catching items of furniture, in-lay work, coffee tables, wall hangings etc. are worthwhile purchases. Rich silks, wooden toys, leather puppets, Bidriware and other artefacts make ideal mementos.